Forecast listings and even today is a very pleasant 23 degrees in Avignon! I flew to Marseilles with British Airways – very civilised and after a 75 minute transfer I arrived in the enchanting village of Crillon, a collection of limestone houses, surrounded by olive groves and vineyards. Peter Chittick the French /Canadian owner and former lawyer came to Provence over twenty years ago met his wife and decided to stay. One by one, he acquired most of the houses in the village and converted them into hotel rooms, each one different to the next .This hotel is quirky. There are no long corridors leading to bedrooms, no rooms the same , no formality .Peter has created a home away from home .The style is casually elegant , a mark of designer Judy Hutson who designed The Pig Hotels but there is no mistaking you are in Provence. After a warm welcome, I was taken to my room and ordered a green tea to sit and savour the views across to Mount Ventoux in the distance. I am getting very brave in my old age and used to travelling alone so, eager to make the most of the evening sunshine , I ventured down to La Grange Terrace for a class of champagne…I was in France after all! I could imagine that actually just a couple of nights here would be a real tonic….relaxing in a stylish environment but at one with nature. Dinner that night had been booked in Bistro 40k, the hotel’s more relaxed restaurant where all the produce is sourced from within 40 kilometres. I did find it vaguely amusing that I walked in and was escorted to a table set for one much to the bemusement of all the happy couples, dressed in smart casual linens and loafers, clearly wondering how anyone could come here alone. It was the ladies in particular who kept casting surreptitious glances over to me and I have no doubt that I was the topic of conversation with many of the diners that evening .As the waiter showed me to my “solo” table, I clocked two family tables, one English, one German which made me think about how appropriate this hotel is for children. Whilst they welcome families, I would suggest that Crillon le Brave is more suited to couples or indeed two girlfriends in search of tranquillity, a beautiful setting, fabulous food and fine wines. The menu in Bistro 40k is Table d’hôtel and was tasty and well-priced. There are three other restaurants within walking distance of the hotel and a very French bar next door should guests want a change of scenery at any point. I woke up to glorious sunshine and breakfast on the terrace. The buffet included smoked salmon, cheeses, and a wide selection of homemade breads and pastries, cereals and fruits and of course omelettes from the menu. After breakfast, I met the charming Laeticia who manages reservations and Front Office at Crillon le Brave and showed me around the hotel bedrooms. There are 34 rooms in total starting with Classic rooms overlooking the village or gardens. For families, there are 3 Junior Suites where children’s beds can be accommodated in the living area. There are two stunning Master Suites (27 and 33) with private terraces and views to die for ….I would not want to leave the room! The rooms in each house are different and this is what makes Crillon le Brave so unique .I am sure they have guests who return time and again and try a different Maison each time. Rates start from E310 (E360 in mid-season) and the hotel closes from Jan 5th – February 25th each year then re-opens for the exciting truffle season which starts in November and then the first , second and third weekends of March annually. 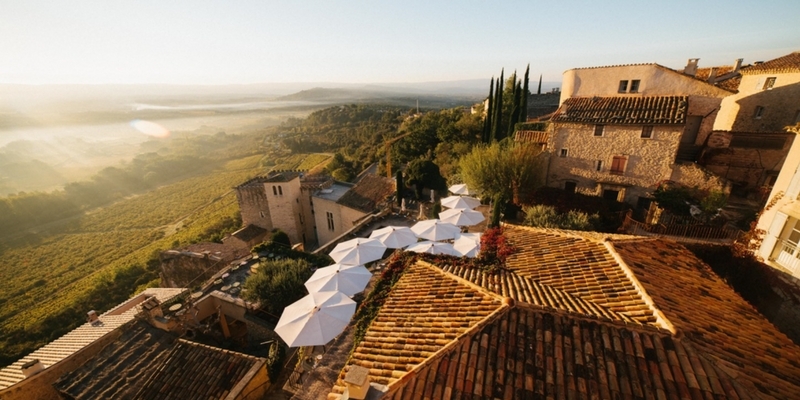 Crillon le Brave has their own Truffle weekend package with one of Provence’s expert Trufflers and incorporates wine tasting at Chateau Neuf du Pape. The hotel is open for Christmas and New Year and I can imagine it would be magical with log fires burning, the scent of the Christmas trees and a feast of culinary treats which brings me nicely to dinner on the second night of my stay at Jerome Blanchet restaurant .This time though I had the pleasure of Peter and Sebastian Pilat, General Manager at the hotel so you should have seen the heads turning that night when I walked in with two handsome gentlemen .I like to keep them guessing! The menu degustation had a mushroom theme that evening so each of the seven courses featured mushrooms and I have to say it was absolutely delicious with the truffle risotto coming out tops! Jerome Blanchet restaurant reminded me of El Olivo at La Residencia in Mallorca in style – the stone walls, candles everywhere and galleried landing for private dining. Guests would definitely remember their culinary experience here and for all the right reasons! Next morning, feeling very guilty for my over- indulgence the night before, I decided to walk to Bedoin, the nearest village which boasts one of the largest forests in France .I have always considered myself a fast walker and anyone who has been on sales calls with me will testify to that fact so when I arrived in the village 40 minutes after leaving the hotel, I was somewhat surprised as I had been told it would take 20 minutes …perhaps they thought I was going “en bicyclette”! It was a wonderful picturesque walk on a beautiful morning and a far cry from taking the tube in London. Evidently there is one of very few remaining shepherds in the village who recounts tales of old shepherds with wolves and lambs but I did not meet him. The village itself is very quaint with gift boutiques and many cafes which I always feel are the heart of French culture. I enjoyed seeing the street stands of fruit and vegetables which are somehow never the same at home. After wandering back to the hotel and a tasty lunch of seabass & grilled vegetables, I left for the airport and of course bought lavender lotions and a bottle of rose at the airport! Crillon le Brave have a number of interesting packages from cycling weekends to truffle hunting and I returned happy that this little gem would fit perfectly into the Highlife Marketing portfolio.